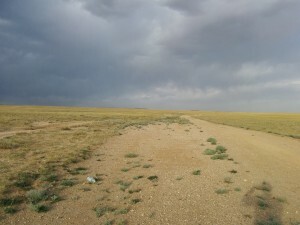 The boys awoke in the field that Rolling Thunder had made camp in, just outside the Central Mongolian city of Altai. The convoy had agreed to get up early, they had been told that the roads ahead were going to be tough going until Bayankhongor and wanted to get as close to the good roads as possible. After their, now traditional, morning porridge the boys packed the car up and set off into another day of desert driving. To start the day Dunc and Henry were in Vera and Matt was in the Mini with Jen. 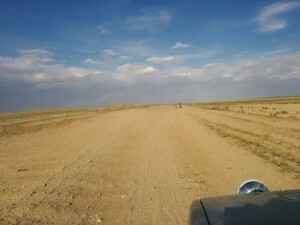 After about 30 minutes of driving along a lovely new road Rolling Thunder saw a track turning off to the right; this track matched descriptions given by Joe (the translator from Khovd) as the way through the desert towards Bayankhongor. Just to make sure this was the right track, Dunc and Henry took Vera a few more miles up the road to see if they found anything more promising. On their return they confirmed to the others that this was the correct track to take. Just as they pulled away the Mini started to steam, it had overheated whilst waiting for Vera to return. As the Mini began to cool Matt stupidly released the cap of the cooling system expansion bottle, in order to try and release some pressure and heat from the system, and some of the boiling hot water sprayed onto his face. Matt sustained some rather serious second degree scalding to his face. Thankfully the combination of him quickly reacting to move his face and close his eyes along with brilliant work from Henry and Dunc to douse his face in water managed to stop the injuries being worse. After the initial worries of how bad Matt’s injuries were going to be, everyone was rather relieved to see that it looked like his face would eventually recover and it seemed as though his eye was unaffected. Aston Micra’s extensive first aid kit also came into good use with Chris taking on the role of convoy Nurse and applying some creams to ease the pain and ensure the scalds didn’t dry out. He also let Matt wear his wide-rimmed cricket hat to keep the sun off his face. Stopping for an afternoon break. After this whole episode of Matt getting burnt, looking after him and confirming that he was OK to continue Rolling Thunder was on it’s way again. Matt was in the Micra with Chris (as they had operating windows), Dan had been kicked into the Mini and Vera was still occupied by Henry and Duncan. Those two had worked more effectively than a fire brigade in cooling Matt’s face but this did mean that the convoy now had very limited amounts of drinking water and it was quite a gamble to head on without finding some replacement hydration. Thankfully after only about 15 mins of driving along the track the convoy came across a small village, consisting of a shop and about 10 other buildings, and bought all of the water they could. The boys, still travelling in two cars, made great progress as lunch approached along the gravel tracks. The road was actually very smooth in places and all 3 cars got up to some impressive speeds and the driving was enjoyable; in other places it was of course terrible with the rumble strips coming back to play. The convoy stopped for lunch in the middle of the desert during the early afternoon and put a sheet up to give Matt some shade, noodles were of course on the menu! A view from the Micra. The afternoon was very similar and all of the cars seemed to be working well across the loose terrain. The boys had been told that they would have to cross a river sometime today but they had not expected one as big as what they came across mid-afternoon. This river was both deep and had a very strong current, even Dan had to conceded he wasn’t going to drive through this! 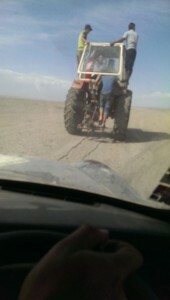 Thankfully there was an organised (well organised by Mongolian standards) group of men with tractors that you could pay to be towed through the river and a kind local gave us an indication on price to stop us getting mugged off. Whilst the boys were doing the usual preparation for a river crossing (covering the intake and exhaust etc.) another rally team arrived. They were a group of 3 ex-USAF servicemen in a Citroen Saxo which had a chassis that was almost splitting in two just in-front of the rear axle. Having four teams allowed Henry to bargain with the tractor operators as they could now take us across in two groups of two and he got us all a good price. The crossing, however, was less than straightforward. Each tractor only had one tow rope so the Mini was held on using the rubbish AA ropes that had let us down a couple of days beforehand. Sure enough the Mini broke free in one of the smaller tributaries to the river, thankfully it was shallow water but did mean that that tractor had to do two trips. The main river was so deep that all of the cars floated across behind the tractor, even the wildly overweight Vera! On the Mini the water even got up to the bottom of the windscreen! When the cars were all through the teams let them drain for a good twenty minutes; during this time one of the Americans gave Matt some burn bandages for his wrist and face and assured him he’d be all right. After a few splutters, especially from the Mini, all four cars started and Rolling Thunder were on the move again. Unbelievably after about 200 yards they came across another river!! This one was shallower but Vera cut out mid-crossing with Henry giving her too few revs. After the boys had pushed her out they then had to help Jeniffer get the Mini up the steep bank of the river, The Mini was sounding worse than ever. The river crossings had taken a lot longer than anyone had anticipated and it now looked as though they wouldn’t make Bayankhongor before night fall (they had been advised not to drive in the dark after another rally team had hit a camel approaching Khovd). Despite this the convoy struggled on, now with four cars, along the heavily rutted track they were following Eastwards. As they got within 100 miles of Bayankhongor the roads became looser and this allowed the teams to gain a lot of speed, the Americans certainly weren’t holding back with their broken chassis! After several hours of fun rally driving, creating dust trails and having a few sideways moments the dun began to set. It looked as though a massive storm was about to hit the boys but nothing ever came of it. 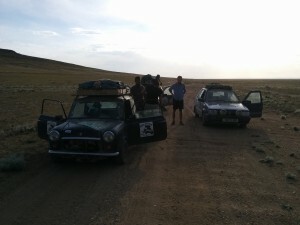 After a brief break the teams agreed to stop shortly with the Mini leading the way looking for a camp site, the Saxo was going to carry on as they didn’t care about driving at night. Trying to find a place to camp. After about 10 mins the Mini and the Micra pulled off next to the road but Henry and Duncan inexplicably carried on in Vera! Matt, Chris, Dan and Jen started making camp expecting the other two to return but they never did…..
After a brief argument as to whether they should carry on or not Henry handily reversed onto a rock and split Vera’s fuel tank, they were now stranded in the middle of the desert, in the dark! They tried in vane to plug the fuel tank and had to beg a local to tow them about 10 miles to Bayankhongor, he wasn’t very happy as he had an automatic but agreed for a premium price. Once they were in town they found their old friends The Haggis Hunters and another team The Yorkshire Special Branch and stayed in a hotel with them. Unaware of Dunc and Henry’s troubles the other four made dinner and went to sleep, after cleaning out Matt’s wounds of dust, hoping to meet up with them in the morning. Matt had to sleep in the Micra as he had no tent and had to borrow warm clothes from the others as all of his belongings were with Dunc and Henry. So there we are, the boys spent their first night separated since the start of the rally and one of them had sustained bad burning to his face, quite a day!